The Ohel concert is fast approaching. Check out this latest ad, featuring posters for past Ohel concerts. Will the past hold clues to the future? 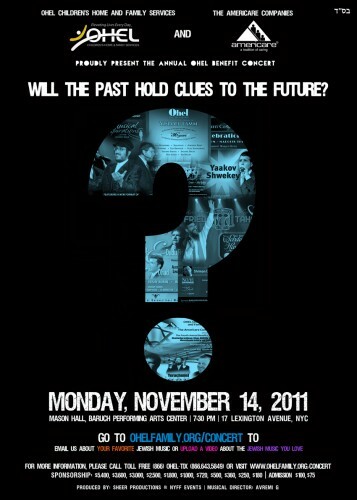 The show will be held on November 14th, 2011 at Mason Hall, Baruch Performing Arts Center at 7:30 PM. Located at 17 Lexington Avenue, NYC. Go to OhelFamily.Org/Concert to Email us about your favorite Jewish music or Upload A Video about the jewish music you love! For more information, please call Toll Free (866) OHEL-TIX (866.643.5849) or visit www.ohelfamily.org/concert. Produced by: Sheer Productions & NYFF Events | Musical Director: Avremi G.